What is a Motor Starter? Be Careful! The information presented below is a collaborative effort by several people. The people providing this information may or may not be providing completely accurate information. The information may or may not be relevant to your situation or particular equipment and may or may not comply with local codes. The information should be used as a reference source only. If you are not sure about anything presented, please do not risk your safety, property or life. Hire an electrician. Motor Starters are switches specially designed for starting motors. These switches are designed to withstand the larger loads required by motors. There are basically two types of motor starters, Manual Starters and Magnetic Starters. The relay contacts are heavy duty and are rated for the motor starting current. 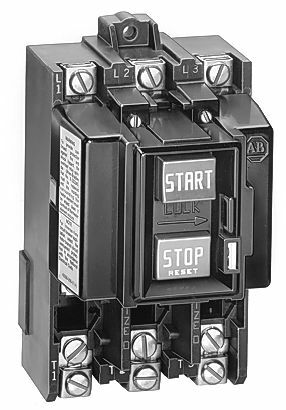 Service Panel circuit breakers are designed to protect building wiring, not motors plugged into wall receptacles. 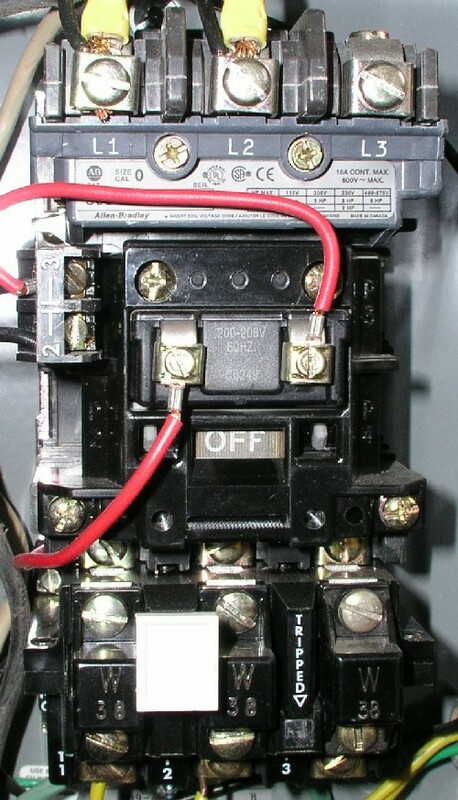 If your electrical box circuit breaker trips before your motor burns up, it is incidental, not on purpose. However, motor starters are designed to trip on heater overload before the motor they start burns up. 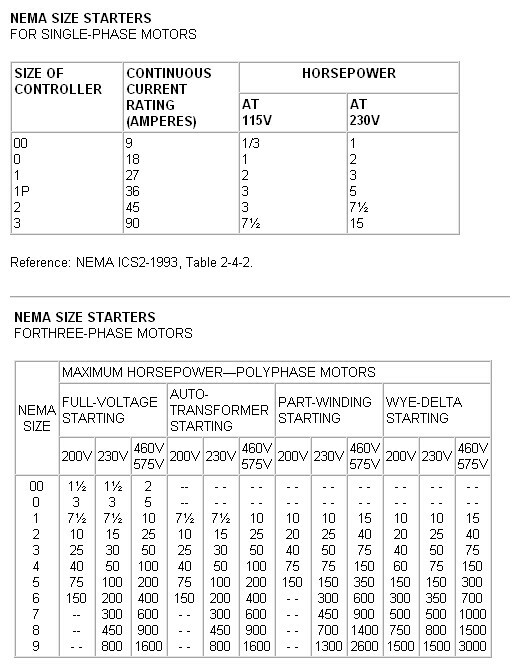 Manual motor starters are simply manual switches designed to control larger current loads typical of motor control. They may be small and similar to the light switches in your home, or they may be much larger dedicated switches designed for control of high amperage circuits. These motor starters may be either Single Pole (switch one line only) or Double/Triple Pole devices (switch 2/3 lines). When a Double/Triple Pole manual motor starter is turned off, the power from the power cable is completely disconnected from the motor. Manual motor starters may also be equipped with matched heaters, which are overload protectors designed to open when the current load is too high. These heaters must be properly sized to the motor they are protecting or else they will either open too soon, or will not protect the motor. The disadvantage to manual motor controls is that they cannot have remotely located On and Off controls. Manual Starter? 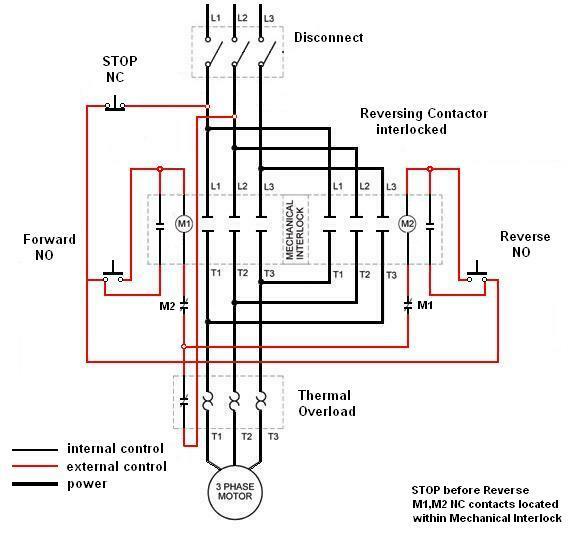 Follow the wiring sequence as below and merely ignore the control wiring in RED. There are single pole starters that should only be used for 120 volt motors. L1 is Line 1 in and should be the "hot" black wire. T1 is Motor 1 out and goes from the starter to the motor. In this case, Neutral "White" is carried through to the motor bypassing the starter altogether. This wiring should not be used on 240 volt circuits. 240 volt, 1 phase motors should use a 2 pole starter. L1 is Line 1 in and should be connected to one of the "hot" wires, L2 is Line 2 in and should be connected to the other "hot" wire. T1 and T2 are the corresponding motor out connections and should be carried through to the motor. Three Phase motors require 3 pole starters and each of the "hot" lines must be switched through the starter. Magnetic Motor starters are essentially heavy duty relays, often equipped with heater/thermal overloads matched to the motor they start. They are then controlled using a lighter duty (low or high voltage) circuit, auxillary relay contacts and a control station (or several stations) utilizing lighter duty switches (usually momentary sometimes latching). These switches would not be capable of switching the large loads required by the motors. Because the control circuitry is separate from the Load circuit, the On/Off controls can be mounted remotely and can even be duplicated if desired. 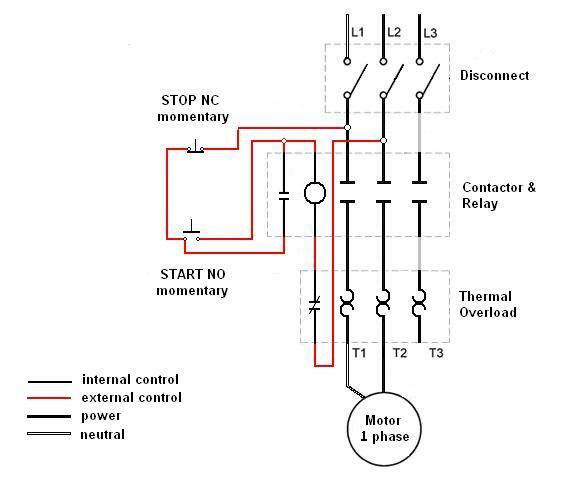 This type of motor starter will usually have an auxiliary contact switch: a smaller set of contacts that opens or closes along with the motion of the main contactors. These contacts will be used to latch the system in an on condition (contacts shown in the picture below as 2-||-3). Latching means that the auxiliary contact bypasses the ON button so the solenoid remains energized, until a separate OFF button cuts the power. Additional contacts (NO & NC) may also be provided and may be used for auxiliary circuits or to provide feedback to the rest of the system that the starter is engaged and the motor has power. Connector numbers will vary among manufacturers - typical numbers in brackets(). For the single phase connections the two current-carrying wires are designated "hot" and "neutral". For North American 240 volt service these will actually both be hot wires but we stick with the hot/neutral naming to keep it simple. Low Voltage Control with transformer - The transformer output must be rated at the appropriate value for the relay coil (typically 12 or 24 VAC) in your particular starter. This should not be an issue with a manufactured magnetic motor starter as the transformer will have been chosen by the manufacturer to match the coil. Input power for the transformer comes from two legs of the primary input power, chosen to match the input voltage requirements of the transformer. Line Voltage Control without transformer - Magnetic Motor Starters which have relay coils at line power levels do not use transformers. Power for the starter relay is taken from two legs of the primary input power, chosen to match the input voltage requirements of the relay coil. In either case, power should be taken from below the manual disconnect (if used). This will ensure that there is no power in the box once the manual disconnect has been thrown. All diagrams are intended to illustrate the logic of a latching contol circuit. 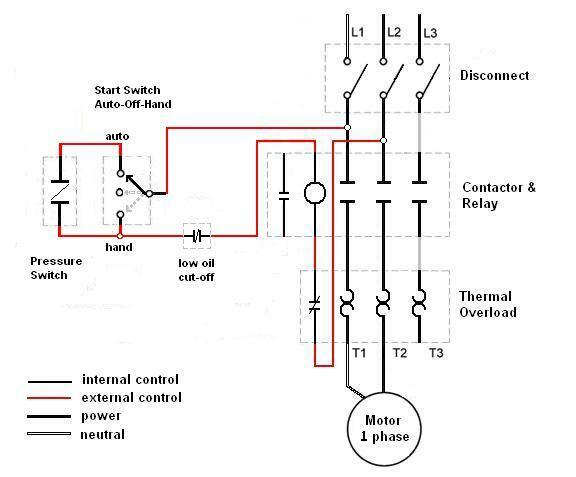 Your motor starter may use wiring which is internal to the starter, wiring which is different than the diagrams, etc. Please refer to the manufacturer's literature if in doubt. If you are not sure of how to make the connections on your equipment, hire an electrician. Improper wiring can Kill, Injure, Start Fires, Burn Out Motors or any/all of the above. The above wiring diagram assumes your magnetic starter has a 240V coil. If you have a 120V coil, instead of running a line from Coil - Overload - L2, you must run Coil - Overload - Neutral. Line Voltage Control - double contactor three phase motor starter controlling a reversible three phase motor (rev 08 Aug 2006) (Note: L1 becomes T3 and L3 becomes T1 when the reverse relay is actuated.) The motor must be STOPPED before REVERSING unless the contactor allows for on-the-fly reversing. The coils are locked out via the NC contacts (M1, M2) usually contained within the mechanical interlock. When Coil #M1 is engaged, Coil #M2 is locked out and vice-versa. Line Voltage Control Magnetic Starter controlled by a air compressor pressure switch (NC). Includes Auto/Hand/Off control and low oil switch (NC). Both of these are optional and may not be present in all applications. In some cases, the switch will include only Auto/Off. The Auto/Hand/Off is sometimes an integral part of a factory pressure switch. Auto allows for unattended, automatic starting of the compressor when the air pressure in the tank falls below the preset limit. Hand (manual control) allows the pump to be turned on regardless of the position of the pressure switch. This may or may not be appropriate for all applications and is shown in the interest of completeness only. Hand should be used with caution and due consideration to what is happening in the circuit. Off is self explanatory. If no low oil switch is present, merely remove it from the circuit and continue the wires from the start switch back to the coil. Incidentally, the same circuit can be used to power a sump pump. The float switch (NO) for the sump would be connected in place of the pressure switch. When the switch detects liquid, the contacts will close and the pump motor will start - assuming that the Start Switch is in the Auto position. Hand is obviously desirable in a sump pump application as it allows the pump to be activated even if the float switch is not functioning. One of the advantages of magnetic starters is the ability to add control stations. These stations may be located at any convenient location and duplicated as required. The maximum number of stations and their location is unlimited for all practical purposes. 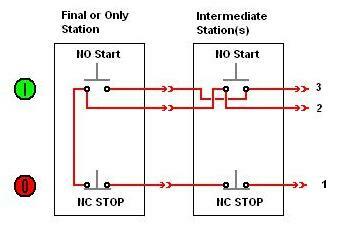 Stations are built using Normally Closed (STOP) and Normally Open (START) momentary contact switches. These switches must be rated for the control circuit voltage at a minimum. Over-rated switches will work fine. 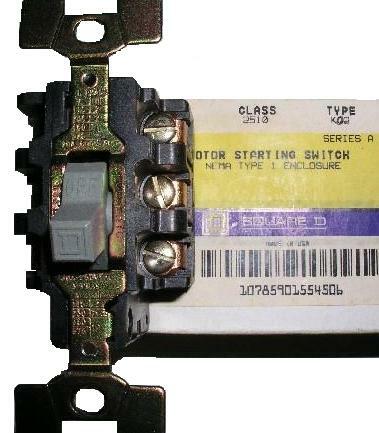 Many manufacturers incorporate both Normally Open (NO) and Normally Closed (NC) contacts in a single switch body. By rewiring the switch you can change it from one to the other. Many manufacturers also provide interchangeable buttons in at least red and green. The last station must always be provided to complete the circuit. The intermediate stations may be repeated as many times as required. Suitable 3 conductor control wiring is required from the starter to each of the control stations in turn (daisy chained).